For one who wasn't much into Chanel Peridot, I seem to be collecting quite a few possible dupes for it. Well, okay. This is possible dupe Number Two. Even then, I think two is one bottle too many already. I featured Douglas Fireworks 15 last month. 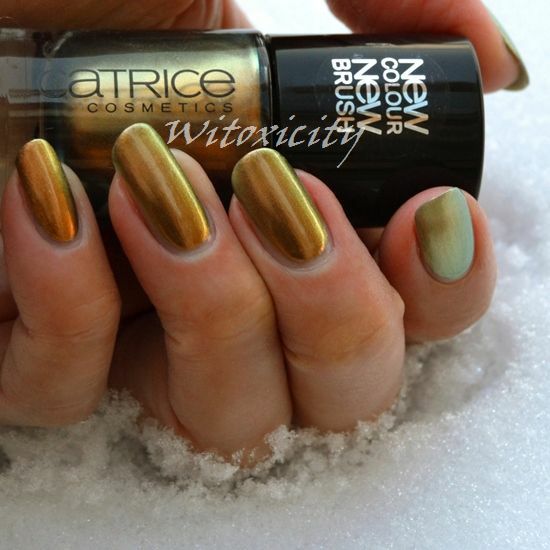 Just a couple of weeks ago, Catrice added some new polishes to its main collection and it included this one here. 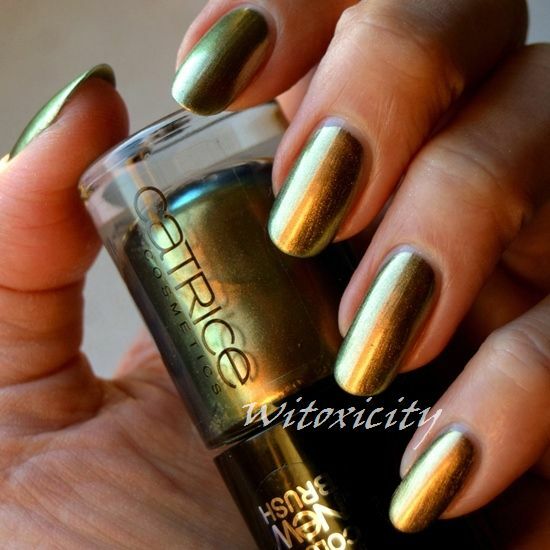 Catrice Genius In The Bottle is an opulent gold that glows green/aqua, or as convention would have it, it's a gold-green/aqua duochrome. The formula is quite sheer and I had to put three coats on. I'm not big on comparisons but I thought I'd do one here. 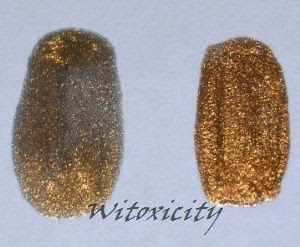 So, what is the difference between Catrice Genius In The Bottle and Douglas Fireworks? 1. Genius In The Bottle is on the sheer side and it shows more of its (dark/grey) green initially. 2. The gold of Fireworks is denser and more dominant. 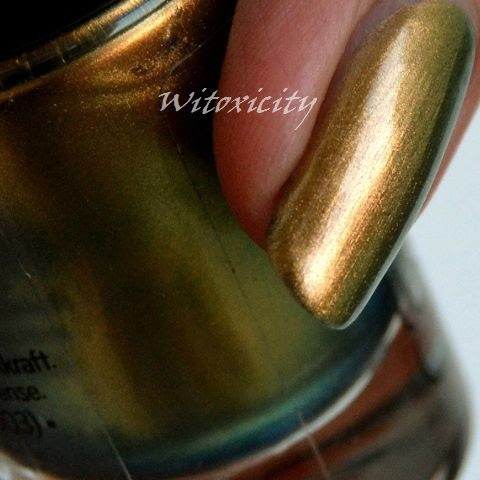 Its formula is thicker (and required just the usual two coats). 3. The gold in Fireworks is yellower and more intense than that in Genius In The Bottle. 4. Fireworks comes with a double-cap. Genius In The Bottle doesn't. 5. 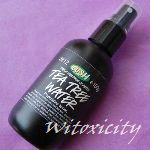 The brush for Genius In The Bottle is mighty wide, quite flat and has a rounded tip. The one for Fireworks is only a bit narrower and its tip is angular. 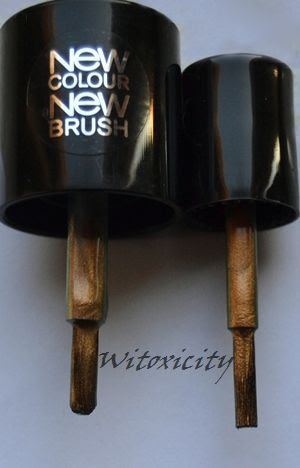 Personally, I love love love the new Catrice brush. Its width, its shape and how the brush spreads out on each nail make it possible for me to apply a coat of polish in one neat stroke. There was incredibly minimal clean-up afterwards. Of course, everyone's nails are shaped differently, so opinions may differ. Oh, there is one more difference. 6. Genius In The Bottle costs just €2.49 (10ml). Fireworks costs €4.95 (11ml). 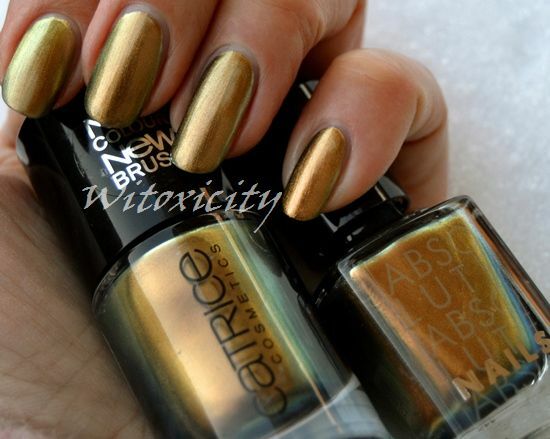 I was so happy when Catrice came out with this one! I really love it. I even thought about buying a back-up, something I never do. Your swatches/pictures are beautiful as always. Wow this is a nice gold / copper shade. Of course you have to love this one. Beautiful and smooth. Love the coating. Ik ga maar gauw even langs bij het Kruitvat. It was goodbye Chanel and hello Douglas, but there's a new player in town now for this dupe. Wow Catrice is even cheaper, how many bottles can you buy for the price of 1 Chanel? I think 10 bottles or so. Oh, goed dat je deze ook hebt, Nikki! Deze lak is zeker een aanrader (zeker voor zo'n leuke prijs). Ja, ze hebben een aantal nieuwe kleuren in het assortiment en sommige hebben ook aparte/grappige namen. :D Groetjes! Beautiful colour. Too bad that you can't get Catrice products over here.